George A. Colello, 66, of Lacey Township, died Wednesday at Community Hospital, Toms River, NJ. Mr Colello was born in Jersey City, and lived in Old Bridge Township before moving to Lanoka Harbor section of Lacey 14 years ago. He was a correction officer at Rahway State Prison before his retirement. 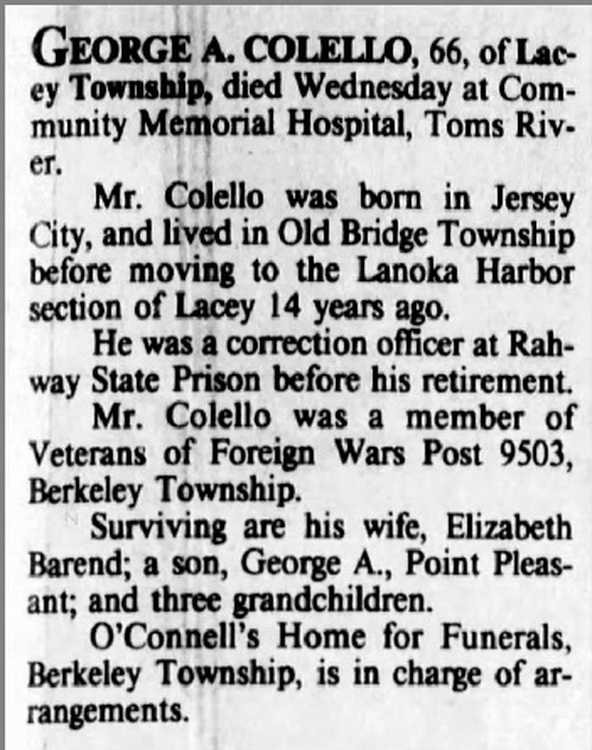 Mr. Colello was a member of Veterans of Foreign Wars Post 9503, Berkley Township. Surviving are his wife, Elizabeth Barend, a son, George A., Point Pleasant; and three grandchildren. O'Connell's Home for Funerals, Berkley Township is in charge of arrangements. 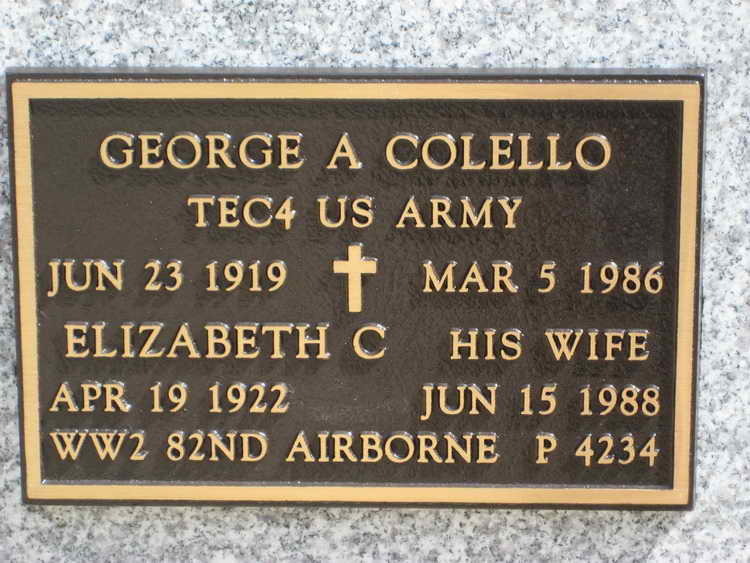 Grave marker for George A. Colello and spouse, Plot P, Grave 4234 in Brigadier General William C. Doyle Veterans Memorial Cemetery, Wrightstown (Burlington county), New Jersey. George enlisted in the Army at Newark, NJ on 14 January 1942 and when the call went out after that year, he volunteered for parachutist duty. Pvt Colello was assigned to Service Company, 508th PIR. His exact date of arrival is unknown as the company's morning Reports for 1942 are unavailable. However, by 8 August 19843 Pvt Colello was holding the rank of T/5 which he held until he was discharged on 11 July1945. His service was entirely within Service Company.